On a small island, a brilliant computer programmer has spent the last 15 years of her life confined to her small apartment in a high tech research lab. In that time, no one has entered or left—until the day her armless, legless, wedding dress-clad corpse comes rolling out of her room. But before we get into all that, the basics. The Perfect Insider is the story of Shuhei, a highly intelligent, borderline misanthropic college professor and Moe, the well-to-do daughter of his deceased mentor. In a bid to get closer to Shuhei romantically, Moe gets permission for her, Shuhei, and some of his students to camp on a small island that is home to a world-famous research lab—the lab that holds Dr. Shiki Magata: a genius programmer and the murderer of her own parents. Throwing around her family’s influence, Moe is even able to get access to the lab for her and Shuhei. But when the pair try to meet Shiki, the apartment door opens for the first time in 15 years revealing the reclusive doctor’s body. Driven by a deep admiration bordering on reverence for the deceased genius, Shuhei sets out to solve the case—with Moe acting as his more-than-a-little-jealous assistant. Set in a high tech lab, The Perfect Insider presents a locked-room mystery for the digital age. All the doors in the building—including Shiki’s—have handprint scanners that log everyone’s movements. Moreover, security cameras cover the only way in or out of Shiki’s apartment. 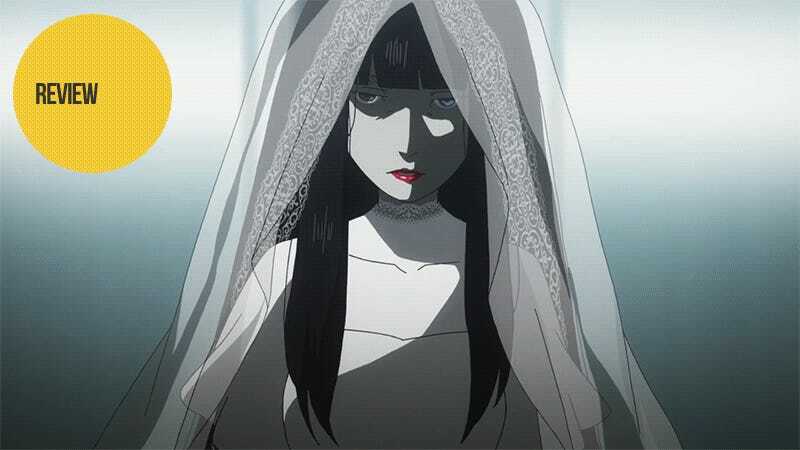 Despite all the proof of no one entering or leaving the room for 15 years, Shiki clearly has been murdered, with her arms and legs chopped off and her corpse put in a wedding dress. While much of the anime’s run time is spent on solving the mystery, most of the clues in The Perfect Insider are psychological rather than physical. To solve the crime, Shuhei and Moe have to come to understand the late doctor—how she thought, felt, and lived her life from childhood to her death. In the story, Moe is our viewpoint character. While a mathematical genius in her own right, Moe is a normal girl—albeit a very rich one. Shiki, on the other hand, came from a likewise well-off, intelligent family but her own genius tendencies caused her to murder her own parents—a crime that she was found not guilty of by reason of insanity. As a person, Shuhei’s mindset is somewhere between those of Moe and Shiki. He can see the normal world as we do but genuinely despises it. To him, being able to view reality as Shiki did, free from emotions and interpersonal relationships, is a form of freedom he can only dream of. In this way, the story of The Perfect Insider is a battle between Moe and Shiki for Shuhei’s soul. When not focused on the murder mystery at hand, we are treated to various flashbacks fleshing out Shiki’s childhood and the events that led up to her voluntary decade-and-a-half imprisonment. Continuing the parallel with Moe, near the end of the series, we get to see the key event in Moe’s life, how it relates to her relationship with Shuhei, and why she and Shiki had come to view the world so differently despite their similar origins. But while The Perfect Insider is a fantastic mystery with interesting, complex characters, it is also a painfully slow moving one. To keep the story going for 11 full episodes, much of each episode is spent in philosophical conversations between Shuhei and Moe—namely ones about human nature that are only tangentially connected to the mystery at hand. Often, these conversations are interesting in their own right on a purely philosophical level—as Shuhei argues the rational side and Moe the emotional one for each topic—and they help flesh out how each of the two main characters thinks. However, the conversations are so numerous that they begin to lose any real impact as they distract from the infinitely more captivating murder mystery. Really, it is only in the final three episodes that clues vital to solving the mystery start to appear. If you don’t mind spending as much time on philosophy as you do on solving the case, The Perfect Insider is a fantastic murder mystery. The detective character and his assistant play off each other well and the victim is truly interesting and worth all the time we spend fixated on her. But best of all, it is a locked-room mystery where both the whodunit and howdunit of the story are equally satisfying. The Perfect Insider aired on Tokyo MX in Japan. It can be viewed for free and with English subtitles on Crunchyroll and Hulu.